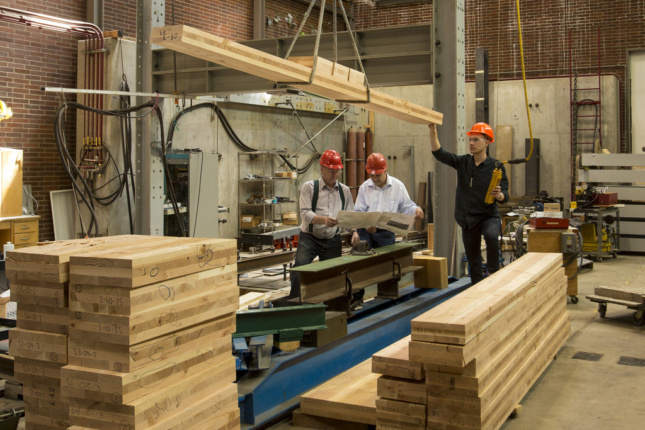 Since seismic risks in Europe (Italy excepted) are milder, the transfer of CLT technology to Canada and the U.S., particularly for larger scales and open plans, requires standards addressing lateral forces. The next hurdle is for the American Society of Civil Engineers’ influential code book, ASCE 7: Minimum Design Loads for Buildings and Other Structures to address CLT, particularly its response-modification coefficient or R factor (not to be confused with R values for thermal resistance) in its seismic design provisions. “To make [CLT] economically competitive,” van de Lindt said, “it really needs to have these seismic performance coefficients (essentially an R factor) in the code, so that people don’t have to get special permission every time they want to use it,” incurring engineers’ reviewing costs. Results of van de Lindt’s R-factor studies are expected next year, and the code-revision cycle takes about five years; if a proposal based on the findings passes review by Building Seismic Safety Council committees and a public-comment period, it should enter the 2022 edition of ASCE 7, then IBC. Andre Barbosa of Oregon State University’s School of Civil and Construction Engineering and Tallwood Design Institute concurred, noting that CLT projects above about ten stories are often hybrids with concrete cores or steel for lateral resistance. “You get the best out of both materials. You have the CLT that’s lighter; [its] strength-to-weight ratio is very, very good. You get the concrete that allows you to go to longer spans, but also it creates that natural barrier for smoke and essentially for fire across floors.” Current methods of addressing timber’s susceptibility to moisture and insects are generally adequate, he says, adding that long-term deflection (creep) in CLT buildings tall enough for large loads needs further study. Flammability is “a concern very often expressed, but an easy one to dismiss,” said Lech Muszynski, associate professor of wood science and engineering at Oregon State University’s College of Forestry. Studies support the counterintuitive idea that charring produces an insulating layer that actually slows pyrolysis, making it advance predictably and sparing enough wood to pass two-hour fire-resistance tests. “I’ve done some testing on unprotected CLT assemblies here in the states, large-scale floor and wall assemblies; there is a large library of similar tests being done in Europe in the past,” Muszynski reported, crediting Ario Ceccotti of the Istituto per la Valorizzazione del Legno e delle Specie Arboree (Trees and Timber Institute) for similar research in Italy and Japan. 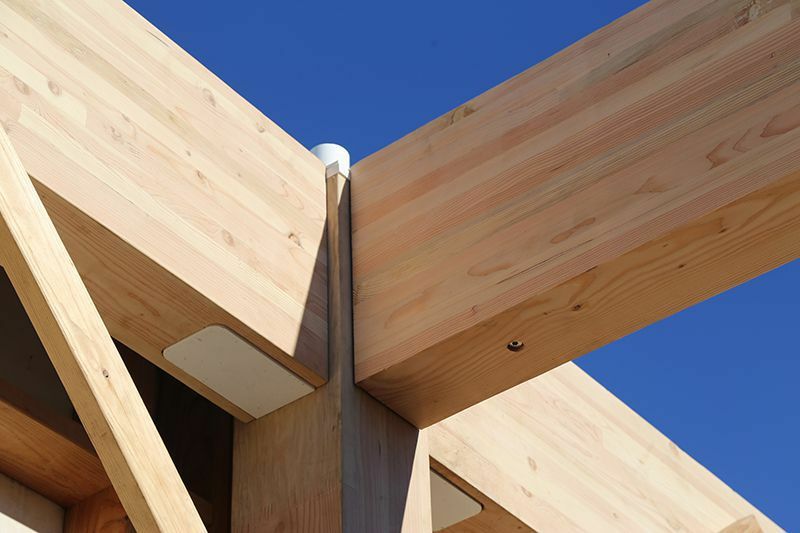 These tests have largely involved exposed CLT, though in practice the material is commonly encapsulated in gypsum board, adding another hour or so to its fire-resistance rating. Two commercial CLT manufacturers in the U.S., Muszynski noted, Oregon’s D.R. Johnson (which he advises) and Montana’s SmartLam, have their products fire-certified. Steel components within joints, Muszynski added, are more vulnerable than the wood. He uses a photo from the 1906 San Francisco fire to illustrate “the difference between flammable and fire-safe”: A severely burnt wooden beam shows charring and exposed nails, indicating deep fire penetration, but remains rigid, while two heat-weakened steel beams flop across the wooden member, resembling soggy pasta. Adhesives also require attention: Some bonded timber products use melamine urea-formaldehyde resins, which harden under heat, but the more common adhesive is polyurethane, which softens if the char reaches bond lines. Moisture can be more hazardous when worksite protections are lacking: Muszynski recalls an Italian project where financial delays left a site idle for several months, exposing CLT to rain—and underscoring the importance of using contractors familiar with the material.